I have thought about and imagined this day for three years. When Liam was a baby, I would wonder what he would grow up to look like? What would his interests be? Who would be the little boy that would first call me "Mom" and be the first of my kids to go to school? 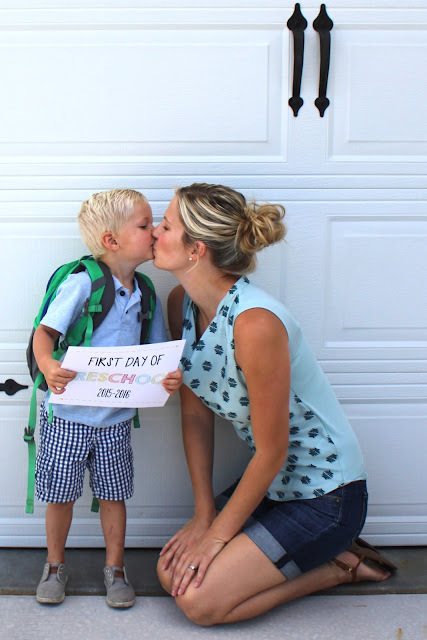 The beginning of school marks the beginning of a whole new phase of parenthood. One day, you find yourself staring at those same blues eyes you fell in love with on the day he was born. Except this time, those blue eyes belong to this adorable toddler who is sitting on your front steps, wearing a backpack, and full of anticipation for his first day! His legs are all scraped up, because he is a boy who loves adventure, & he is willing letting you take pictures due to the promise of a few measly chocolate chips afterwards. 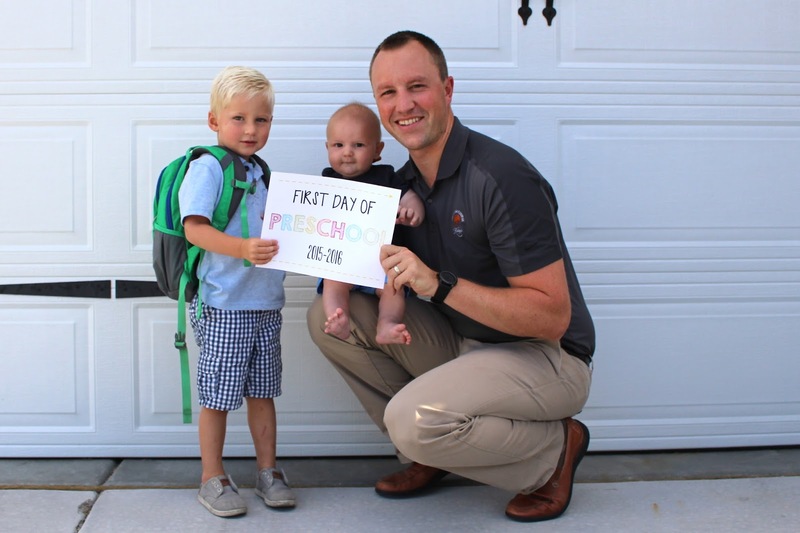 I pulled out of our driveway and found myself driving right behind another mom in my neighborhood who was also taking her boy for his 1st day of preschool. And then pulling in right behind me was yet another neighborhood mom with her kids loaded in the car. It was a surreal moment. I was joining the ranks of the "big kid moms", just driving my boy to school. It felt natural, like something I did all the time. Yet my stomach was a little nervous & my heart a little achy. And then I got weepy, oh so weepy on the drive there! Conor & I both walked him into his school, helped him find his cubby...and then (gasp) whoever uses his cubby MWF left her stuff in there!!! This sent Liam into tears. Yep, he was devastated that someone else's stuff dare to be in his cubby! I thought surely the morning was off to horrible start, but as soon as his teacher opened the classroom door, he gave me a big kiss and strutted right into the classroom. He looked curious albeit a bit timid. But he was in! And happy! And not missing me! I watched him slowly take in the moment & begin to settle in. Oh how my tears started up again. And to break my heart just a teensy bit more, his teacher gave all the parents a little bag with kleenex, hershey kisses, & note that even welled up Conor's eyes. All the feels!!! I think I walked out of his school in a bit of awe. I was fully expecting him to be sad about leaving me. Really sad. Need a few school days to adjust kind of sad. That is what I was prepared for. But my heart beamed at how confident Liam was. I have spent his entire little life building a close a bond with him, one that is full of trust, & the end result has paid off. He knew that I would be coming back for him, so he was excited to meet new friends and find out what all this "school" business was about! After I got the last few tears out, I realized that Finn & I had a bit of freedom. Time to get crazy and bust out as many errands as possible with only one child. It almost felt like a vacation. We hit Whole Foods for some grocery shopping (which is completely empty at 9am, so the experience was rather blissful), then the dry cleaners, then the post office. I had an entire week's worth of errands done, and I still had time to clean up a bit at home before going back to pick up Liam. I think I can quickly adjust to this new schedule! Although, I was more than ready to get back to Liam and to hear all about his day! The moment he saw me, he ran right into my arms with a huge hug! I asked him how school was and his first words were: "It was so much fun!" It was the best! I was so happy to hear that he loved it so much. During our car ride home I learned that he didn't like the snack, he went potty but forgot to wash his hands, some kids missed their mommies, he likes his teacher a lot, and their was a gingerbread man hiding in the kitchen. Eventful first day! And he is already asking why he doesn't get to go to school "all the days"... I am certainly not ready for that! My heart empathizes. G will begin in about a year and a half and even now i get teary. Aww!! I'm so glad he had such a great first day!!!! 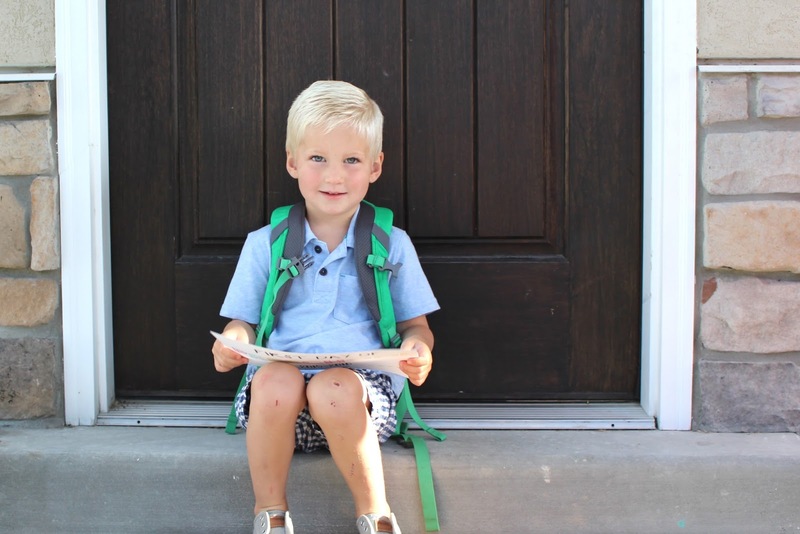 Even though we had Mason in daycare, his first day of preschool was a whole new experience for me. I expected him to be scared or sad or something and I literally didn't even get a kiss, he ran right off! Talk about breaking your heart. But on the other hand, I was so happy he was so excited. Now, every morning, I bend down, get a kiss right on the lips, open the door and he's off. I love that he loves it so much! It makes me feel better about having to leave him everyday. All the feels, indeed, Mama. Caleb is in a two year old class twice a week, and although it makes me so happy to see him playing and interacting with the other kids, it hurts my heart a bit to not have him here with me all day every day. I will say, it is nice to have that time a couple of days a week to get things done and spend some quality time with just Vivian:) Silver linings. ooh tearing me up over here. I love it! I love that preschool sign too...cutest one I've seen. That is amazing. So surreal definitely. So grown up. I'm not ready haha. Oh that is the best first day ever! I'm so hoping that I've created that same trusting relationship with noah that he doesn't worry about me leaving either! Your post gives me some serious hope it will go really well :). And Liam is so super cute with his backpack! I'm so glad he loved preschool! what a great first day for him! I'm also glad you had some time to get errands done too. I can hardly do errands with one child let alone two! I'm so happy to hear it was a good first day! 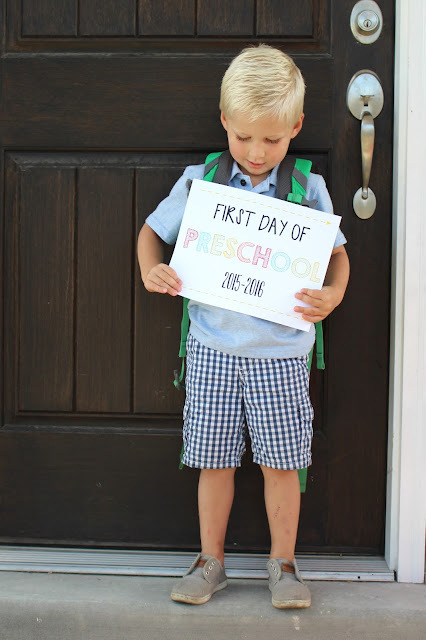 What a great way to start the year, and his school experience! Awwww, such a sweet post and something fun to look back on in a few years. I love that you bribed him with chocolate, it would work on me and so so glad it went well. What a sweet gift for all the parents, that teacher was so kind. Can't wait to hear more about Liam's school adventure. So so so glad that everything went well! For both of you, haha! He is seriously the cutest thing ever. awwww that is so adorable! good to hear it went well (for the both of you) and how funny is the teacher giving you tissues. I'm fairly certain I was the only mom crying too! I was so surprised! Oh, this is perfect!! So happy for a pleasant experience, what a big brave boy you have!! So, so sweet, Laura!! Made me feel all the feels! I'm so glad he did so well! And isn't that little bit of "free" time just amazing?? I originally had signed Wyatt up to go on T, W, TH but I just couldn't do it. ha --I pulled him out of Wed.
annnnd cue the tears.... Go Liam!